While browsing the Selfridges website, I spotted this gorgeous bathmat and towel combo below (5 & 6) by Hay. I really love the unusual the colours and honeycomb textured fabric. I began thinking about how you’d use these colours in the bathroom, and put together this little mood board, just for fun. Typically, people opt for nautical themes or neutral colour schemes in their bathrooms. Grey, white and red is a really eye-catching colour scheme and a very unique alternative. If your bathroom suite and furniture is already white, this theme is pretty easy to achieve. 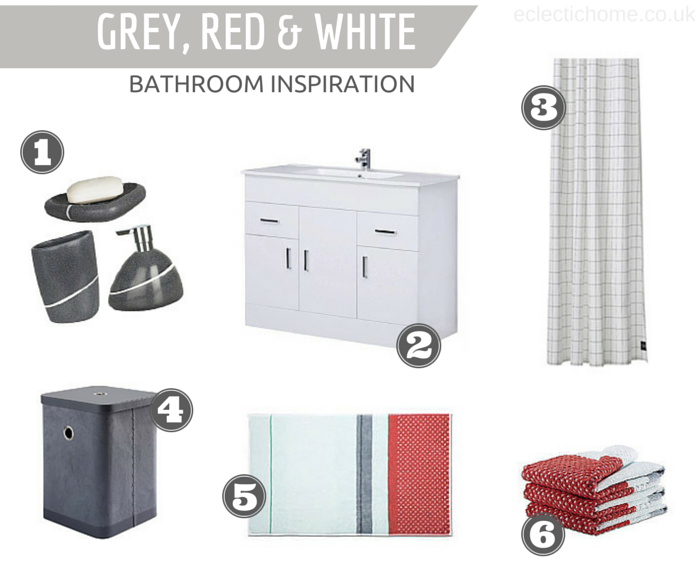 Simply replace all old accessories (like towels, wash baskets, tubs and soap dishes) in coordinating grey and red shades. You could even opt for soft grey tiling to compliment the rest of the scheme. Has this layout inspired you? I hope so! Please tweet us your newly refurbished bathroom to @_eclectichome, tag me in your Instagram pictures or upload to my Facebook page here. I can’t wait to see them! !